Since sharing my experiences with these lash serums, I’ve had quite a few emails and queries about both these new eyelash serums that have just been launched in the Malaysian markets. I’ve also got quite a few requests asking me to compare them. Actually, if you put my Talika Lipocils Expert review and the L’Oreal Renewal Lash Serum review side by side, you might realize that I just did compare them 🙂 One was tested on my right eye and one on my left. My thoughts in both reviews mirror each other. In terms of the lash serums, I actually find that one works better than the other for me but results will vary from person to person. I will say a little about each in terms of texture and efficacy below. I personally prefer the texture of Talika Lipocils Expert. It is light and watery and dries quickly. Applying mascara over it was also no problem. I find the L’Oreal Renewal Lash Serum a little heavy and silicone in texture and mascara did not do well for me over it. When dried, my lashes with Talika feel soft, but lashes with L’Oreal feel more stiff. 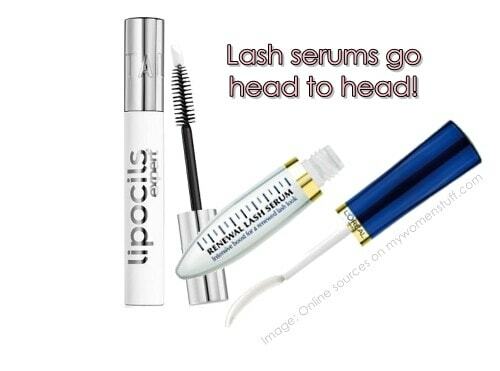 Talika Lipocils Expert retails for RM185 and the L’Oreal Renewal Lash Serum retails for RM49.90. Please read the complete individual reviews with pictures and availability for Talika Lipocils Expert and L’Oreal Renewal Lash Serum by following the links. Ooh on offer! Hope you manage to snag it at offer price! YAY! So happy that it worked to help you grow lashes! I did find that the L’oreal serum does help existing lashes grow longer. Do you feel that its stiff though? I’ve been using the Lipocils Expert for about a month now since it was first launched and I’m getting fantastic results! I’m so surprised that it was actually my boyfriend who commented my eyelashes looked longer!!!! I mean usually guys will not notice anything new on you right? And I’m thrilled that a usually nonchalant GUY would notice it and give such compliments! I also notice my mascara goes on beautifully with my longer lashes now. Will definitely continue using this product and recommend it to friends. I have been using the talika lipocils expert for over 2 weeks and I’m seeing dramatic results. I’ve noticed longer and fuller lashes. I don’t have to wear false lashes anymore and applying mascara on longer lashes is so much easier. I’m looking forward to try loreal’s lash serum next. I’ve been using the loreal renewal serum for monthes now and I haven’t noticed any changes in the condition or length of my lashes. Is the serum formula only affective on female lashes? I was doing some research about the talika lipocils expert gel and I’ve read a lot of good reviews by women who has tried that product. I’m going to get it at sephora next and try it. I used Talika Liposils expert on my lashes for a month, on an on-off basis as I have minor irritation on lower lashes . I noticed the lower lashes are slightly longer than before. For upper lashes I am not sure as I can’t compare much and slightly difficult to view on my own. Will try on my eye brows in the future. Maybe I can use Talika Lipocils in the morning and the L’oreal Lash Serum at night? Do you think that’d work? How and where can i purchase this talika thingie? The locations can be found here. I can’t remember where all the Talika counters are so the link will help.